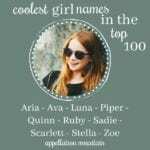 These are my picks for the best trending girl names. Two years ago, I took a look at names that had gained in the US popularity rankings and listed my favorites. And by gained, I mean rose substantially in use, not just a spot or three. In this case, every name on the list increased by at least fifty places – pretty impressive, right? These names span every possible style – the literary and the pop culture-inspired; the traditional and the brand new. Some have been in the Top 1000 for ages; others have debuted more recently. They range from tailored and unisex to frilly and elaborate. They don’t sound like sisters! The only thing they share for certain? All fourteen of them posted impressive gains coming into this year. And I suspect – or maybe hope – that we’ll hear a lot more of them in the coming years. Take our love of flowing liquid names, add the stylish -ia ending, mix in a pop star, and whiz bang – Alessia becomes an overnight sensation. The Italian feminine form of Alexis, Alessia has been big in Italy for years. But it wasn’t until singer-songwriter Alessia Cara scored a hit with 2015’s haunting single “Here” that American parents took notice. It feels like a successor to 80s favorite Alicia and an alternative to chart-toppers like Olivia and Amelia. I’ve yet to write about Alessia, but check back and I’ll update when I do. 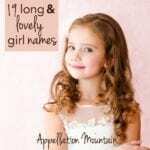 Isabella is fading, but long and lovely girl names will always appeal to many families. Antonella sounds Italian, but it has made a splash in Chile in recent years, possibly thanks to a popular television actor named Antonella Ríos. (Any Chilean readers out there? I’d love your thoughts!) It’s big on Baby Center’s Spanish language site, too. It builds in the appealing short form Nell, and feels like a fresh alternative to Alexandra and Adriana, too. Read more about Antonella here. We all love a good nature name, and some of the best trend unisex: think Rowan, River, and Sky. Briar fits that description, but there’s also a fairy tale romance to the name. That’s because Sleeping Beauty masqueraded as Briar Rose in various tellings, from the Brothers Grimm to Disney. Briar feels tailored, but still rich in sound. 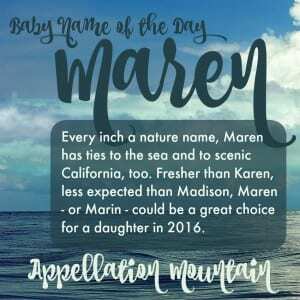 You might even use it to honor someone with a Bry- or Bre- name – a grandpa Brian or a sister Breanne, maybe? I’ve yet to write about Briar, but check back and I’ll update when I do. David spent decades in the US boys’ Top Ten, from the 1930s into the 90s. Despite the Biblical name’s runaway success, feminine forms never really followed. Davina remained outside the Top 750 – and mostly outside of the rankings entirely. But in our age of Ava and Olivia, a long, traditionalish name with a strong ‘v’ sound is too good to overlook. Plus, Davina shares David’s meaning: beloved. Or maybe this is just down to the small screen. Davina Claire is a character in The Vampire Diaries spin-off The Originals. I’ve yet to write about Davina, but check back and I’ll update when I do. We give Francis to our sons, Frances to our daughters, and Frankie? It’s rising in use for both boys and girls. On a daughter, Frankie feels like a sister for Sadie, a less expected choice than Charlie. Drew Barrymore welcomed daughter Frankie in 2014; Amanda Peet uses it as a nickname for her daughter Frances, born in 2007. 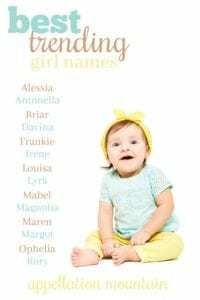 Frankie is the Alex of 2018, a traditional name that appeals for girls without losing any of its charm for boys. I’ve yet to write about Frankie, but check back and I’ll update when I do. Irene means peace, from the Greek goddess. Early saints answered to the name, too. But while Greek names like Penelope and Zoe feel fresh and modern today, Irene seems like more of a throwback. Maybe that’s because the name peaked in the 1910s, and we’ve been warbling “Goodnight, Irene” ever since Lead Belly first recorded it in the 1930s. That lends the name a graceful, vintage vibe. It’s also a name that’s nicely international, familiar across many cultures and languages. One more appealing connection: Irene Adler is an opera singer much admired by Sherlock Holmes for her intelligence. Many an adaptation of the Sherlock Holmes stories has given us a new version of Ms. Adler, including the version Rachel McAdams gave us opposite Robert Downey, Jr. in the 2009 movie and its sequel. Literary and romantic, easily shortened to Lulu and Lucy and Lou, but requiring no short form, Louisa has much to offer. It counts as a classic, one with a powerful literary tie-in: Louisa May Alcott, author of the Little Women novels. 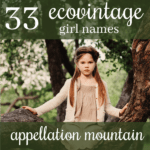 The name peaked back in the nineteenth century, when it lagged behind sister name Louise. 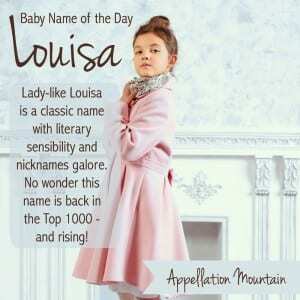 But today, Louisa has rocketed back into the Top 1000, a substitute for Sophia or Amelia. Read more about Louisa here. When The Golden Compass debuted in 2007, I thought Lyra could rival Layla. That’s because the big screen adaptation of Philip Pullman’s His Dark Materials trilogy put his heroine, the young Lyra Belacqua in the spotlight. But it didn’t happen, at least not right away. Instead, Luna – boosted by the Harry Potter heroine – climbed into the Top 100. But today, Lyra is catching on. Like Luna it comes from fiction. But it’s another night sky name, inspired by a constellation. And that constellation? It’s named for the lyre of Orpheus, which brings to mind another new favorite: the musical Aria. Read more about Lyra here. When Paul and Jamie of 90s sitcom Mad About You named their daughter Mabel, it seemed like the craziest of decisions. (Jamie dreamed it up as an acronym for Mothers Always Bring Extra Love.) Today, though? Mabel is back, in a big way. We love the Mae sound, and it feels like a logical successor to the equally vintage Hazel. Read more about Mabel here. Long, romantic Magnolia was big at the turn of the twentieth century, and the name is experiencing a renaissance today. A character on television series Hart of Dixie gave the name a boost. And it shares upbeat nickname Maggie with more traditional Margaret. 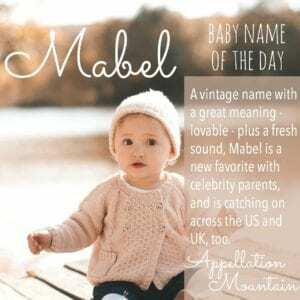 With nature names and flower names so very popular, Magnolia might be one of those ecovintage gems that parents embrace. Read more about Magnolia here. Check out those numbers! Maren climbed over 300 spots in a single year. It’s fresher than Madison, an alternative to Reagan or Harper. Singer Maren Morris keeps delivering country-pop hits, putting the name on even more parents’ radar. It can be seen as a cousin to Mary and Marie, or a form of Marina, from the Latin marinus – of the sea. Marin County – with an ‘i’ sits across the Golden Gate Bridge from San Francisco, but for now, it’s the ‘e’ spelling winning favor. Read more about Maren here. 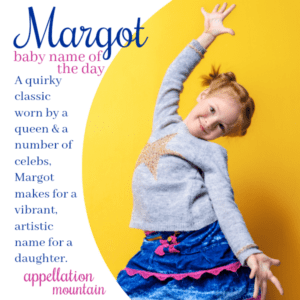 Originally a French nickname for Margaret, Margot feels like a stand-alone name today. Margo – hold the ‘t’ – was more popular in the middle of the twentieth century. But today it’s the Margot spelling that’s on the rise, an ‘o’ ending girl name that feels more traditional than Willow or Harlow. You might think of Gwyneth Paltrow’s character from The Royal Tenenbaums – playwright Margot, legendary ballerina Margot Fonteyn, or Australian actor Margot Robbie. Read more about Margot here. Literary and romantic, Ophelia seems sure to appeal to parents today. It’s an obvious alternative to Top Ten favorite Olivia. The tragic demise of Shakespeare’s Ophelia might give some parents pause, but now The Lumineers have recorded an appealing song by the name, one that has nothing to do with madness. 2006 fantasy movie Pan’s Labyrinth is about an Ofelia, perhaps another reason Ophelia is attracting more interest than ever before. Blame The Gilmore Girls reboot. Or maybe our interest in all of those unisex R names: think Rowan, Remy, and Reese. Rory started out as a traditional Irish masculine name, worn by the last High King of Ireland way back in the twelfth century. 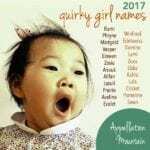 But in the television series, it’s short for Lorelai, and it’s easy to imagine Rory working as a nickname for lots of feminine names with a strong ‘or’ sound, like Aurora. But the name stands on its own, too, and continues to gain in use, a modern choice with a mix of pop culture ties and appealing Irish roots. Read more about Rory here. 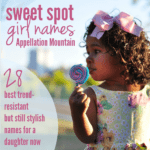 There you have it – my picks for the best trending girl names of the moment. Are any of your favorites on this list?